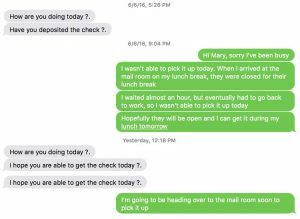 “In the time between when the package was delivered (Friday, June 3rd) and when I picked it up (Tuesday, June 7th), I got many messages from ‘Mary’ asking if I had picked up/deposited the check yet. 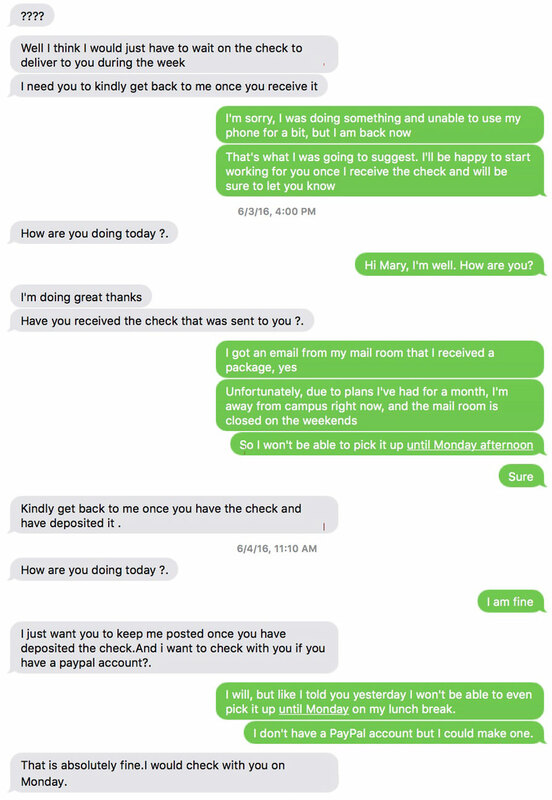 Additionally, she asked me if I had a PayPal account. I told her I did not and she never asked me about it again. 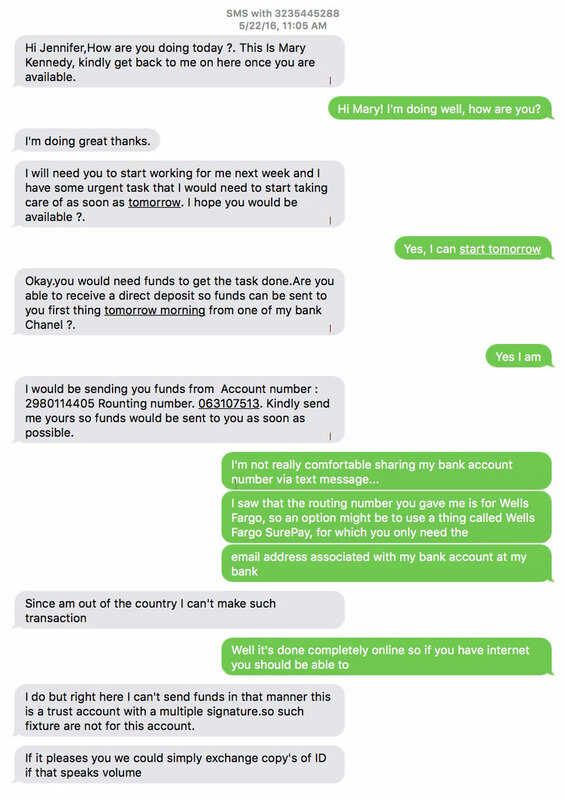 As we said at the start, Jenni is smart and figured out pretty quickly that this was a scam. Many people don’t or don’t listen to their growing suspicions in their gut because they really need the income. 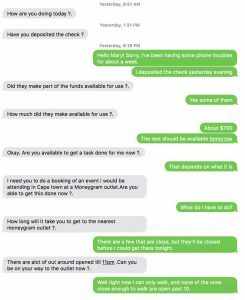 Learn how Steven got scammed out of $2500 while using Airbnb! 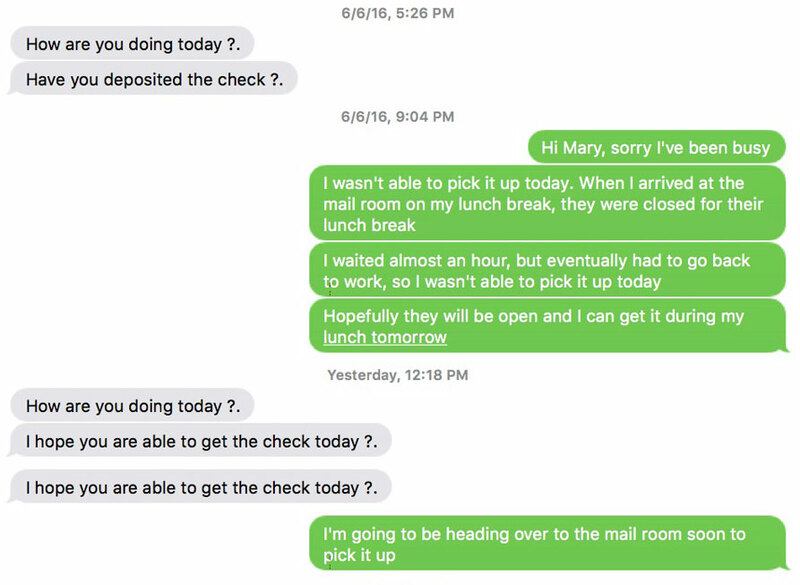 Jenni has provided TDS with the transcripts of her email exchanges with “Mary”, as well as their text message conversations. You can find both below. We’re very glad to know that Jenni didn’t get victimized and are grateful she shared her story with us. Do you know any young men and woman looking for extra income or employment? Share this story with them! Hi,I’m Rose,I saw your contact on houzz I need an interior decorator to do styling (staging) of items we have just ordered in our new apartment. A Little about me my name is Rose .W. Davis,I attended Texas School for the Deaf where i achieved my highest qualification. I have my own business (Self Employed). 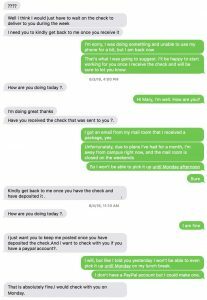 I attend the catholic 36yrs and i am hard of hearing ….my younger brother lived with us his name is Steve here’s #469 532-5760 he is always available just in case you want to call. I work based on the development and counseling of the deaf people in the community, I’m married and I have a two boys 7 months baby and 3yrs Sam. My husband is a Software Developer and System Engineer, We are in the process of relocating to Washington with my husband who based in London, UK he just secured a good job here and he’s to resume on June 26th, 2017. The paintings have been done so you don’t need to worry about that. Where is your location or city? and I would like to know how much you are Willing to charge for your services and if you accept certified check for payment. I would appreciate it if you can get back to us soonest because we really want things sorted before our arrival. I look forward to your response soonest. 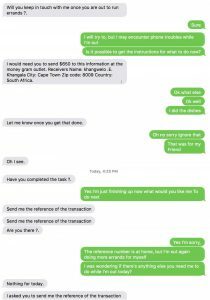 Just like the email directly above, on May 16, 2017 we received another email from a reader named Barb who was also contacted by “Rose Davis” through Houzz.com through the email rosedavis024@zoho.com. “Rose” was again looking for an interior decorator. In the email above “Rose” is relocating to Washington. Below she is relocating to California! comment: Hi,I\’m Rose,I saw your contact on houzz I need an interior decorator to do styling (staging) of items we have just ordered in our new apartment. A Little about me my name is Rose Davis,I attended Texas School for the Deaf where i achieved my highest qualification. I have my own business (Self Employed). I attend the catholic 36yrs and i am hard of hearing ….my younger brother lived with us his name is Steve here\’s #469 532- 5760 he is always available just in case you want to call. I work based on the development and counseling of the deaf people in the community, I\’m married and I have a two boys 7 months baby and 3yrs Sam. My husband is a Software Developer and System Engineer, We are in the process of relocating to California with my husband who based in London, UK he just secured a good job here and he\’s to resume on August 28th, 2017. The paintings have been done so you don\’t need to worry about that. Where is your location or city? and I would like to know how much you are Willing to charge for your services and if you accept certified check for payment. I would appreciate it if you can get back to us soonest because we really want things sorted before our arrival. 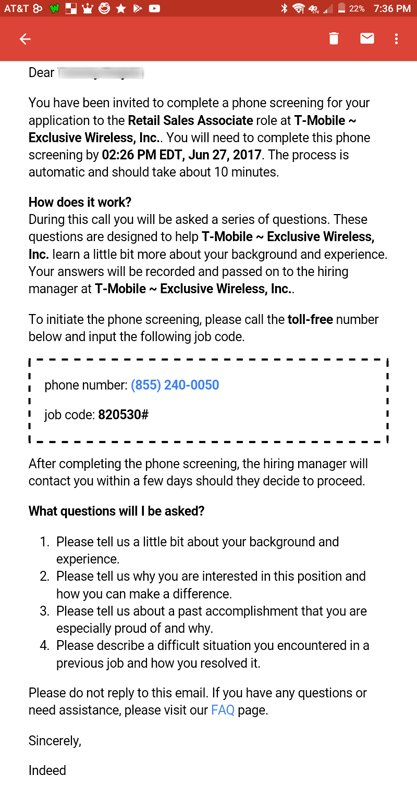 One of our readers was contacted in on May 25, 2017 via text about a possible job. 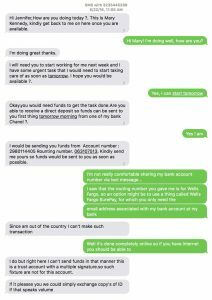 She was told to email a “Mikel Owen.” The text, she says, came from the odd number 1410200501, and identified as from Winniefred Arinze. After contacting Mikel Owen, our reader received the following email. Can you spot the red flags that strongly suggest this is a scam? Clean houses with a variety of chemicals, disinfectants, and machines. Vacuum hardwood floors and carpet. Place fresh linens on bed. Wash, fold, and stock towels. Scrub stains, mold, and mildew from surfaces. Empty wastebaskets and take out trash. Wash dishes and put dishes away in cupboards. Clean upholstered furniture and drapes. Dust tables, wood surfaces, and shelves. Clean and dust window treatments. Stock kitchens with groceries and condiments. Mop, polish, and wax floors. Restock house with cleaning supplies. My financier Clerk will be making out a check to you before my arrival, which you will deduct your pay for the first week and you will be using the remaining to buy foodstuffs, Art galley, home appliance and other things needed in the house. Our arrival date is on the 26th of June. We just bought the house and as soon as all the paper work is finalize and i will instruct my estate agent to mail the keys of the house to you so that you can do all other necessary preparations before we arrive, I will also email you the shopping list after you received check okay..
All I need from you is total honesty and sincerity. I know you will be committed to the work, You will also have a nice period of time working with my wife. I will be waiting to hear from you. I would like to submit my resume for the administrative position advertised on Craigslist. Throughout my career I have consistently driven myself to meet new challenges, and to achieve any and all goals set before me. With focus, drive, determination, and acute attention to detail, I offer your company decisive leadership, dedication, and commitment to excellence. Any task or project I undertake I consistently complete to the best of my ability. I look forward to discussing your top-priority needs and the results you can expect from me. If you are looking for an honest, trustworthy, dedicated employee, I can be reached via phone or email at your convenience. I am a member staff of American International Group, Inc. NYSE: AIG, also known as AIG, is an American multinational insurance corporation. 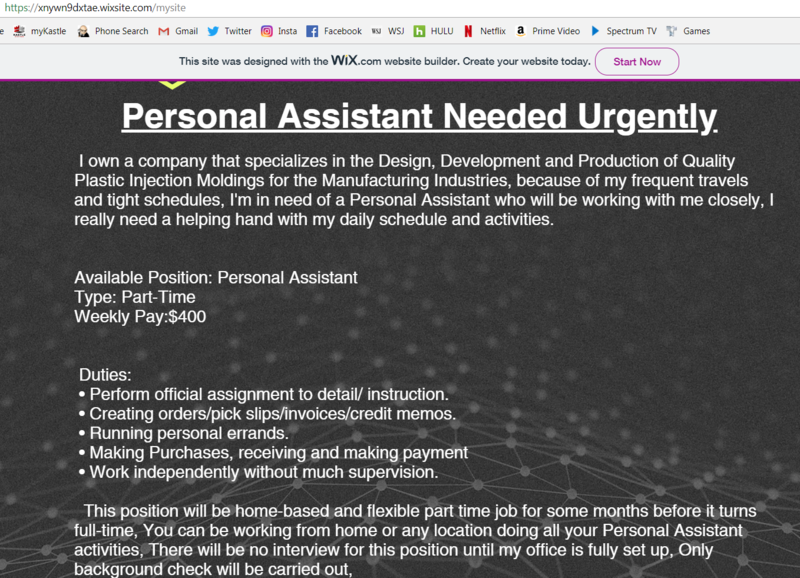 and I have an immediate need for an organized, efficient, & detail-oriented individual for the position of a Personal Assistant due to my high workloads and busy work schedule. I need someone to assist me with the running of my everyday business errands and business tasks so that I can be more productive in my everyday business activities in order to better serve the immediate needs of my clients. This position will come with a great deal of responsibility and trust because I am opening a new office space/apartment in your area of location. The new office will be managed by the eligible person and my secretary. 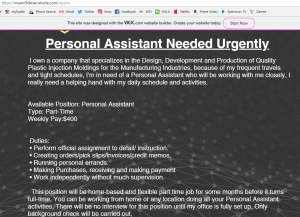 The eligible person will start work immediately from this new office alongside with my secretary by assisting me with running my business errands in my absence in his or her spare time as I am always out of town on business travel status. The major duties and responsibilities of the eligible person will be needed mostly during the weekdays at your own convenience and this will give you free time to go on with your regular job. – Good computer literacy, speed and accuracy essential. Attractive salary of no less than $700 per week with other benefit. All correspondences and reporting should be made, addressed and must be promptly reported to me in due course. As they say, punctuality is the soul of business. I believe promptness is key if any business is to thrive. I want to thank you for your prompt response and after much consideration, I have decided to give you a trial so as to know how honest, sincere, and confident you are, also to know if i can trust and confide in you, It is the 21st century, and the business industry is becoming more demanding by the second, Business owners need to be flexible,present, and accommodating to the needs of their customers, clients and partners. In order to meet these demands, the business owner must double book their calendar; extend their normal business hours, while trying to squeeze in time to do all of the administrative duties. So this is the major reason why I need a reliable and sincere assistant, to enable me achieve and give the best to my business. I will like to know how often you get on the internet because our job requires much checking of your email and do you have access to any instant messenger? 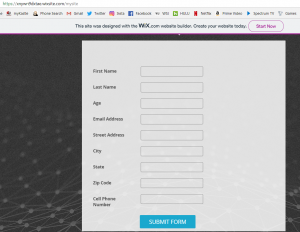 Your trial stage begins immediately you acknowledge this email and some payment will be sent to you for the first task as i mentioned in my initial email let me know when you are ready to start. I need answers to these Questions. How many hours are you willing to Work per day? How often do you come on the internet ? Payroll Interval… (Weekly or Bi-weekly)? Are you employed at the moment ? what bank do you bank with? How are you doing , Hope fine? 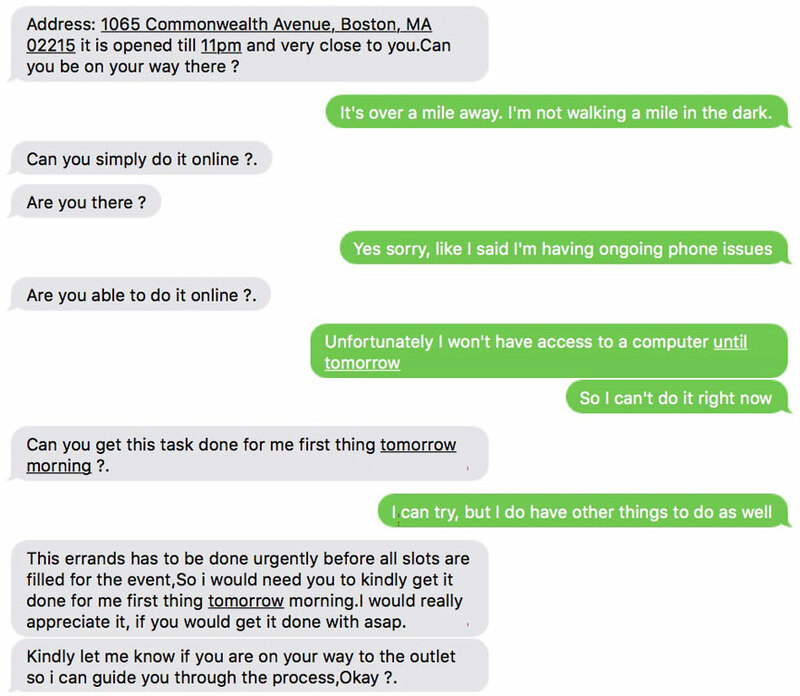 I really appreciate your prompt response and it shows how efficient and committed you are, I want you to understand that i will only be communicating with you online and mostly on instant messenger, text and sometimes call if necessary prior to my arrival. I’ll like to congratulate you once again and to inform you that I have forwarded your payment information to one of my client, he will be sending you the first check Today for your first assignment which you will be using the funds from the check to complete tasks for me while am still here, I will keep you posted on the tracking number as soon as i have it. Your rapid response and sincerity is my main priority. Kindly acknowledge the receipt of my email. 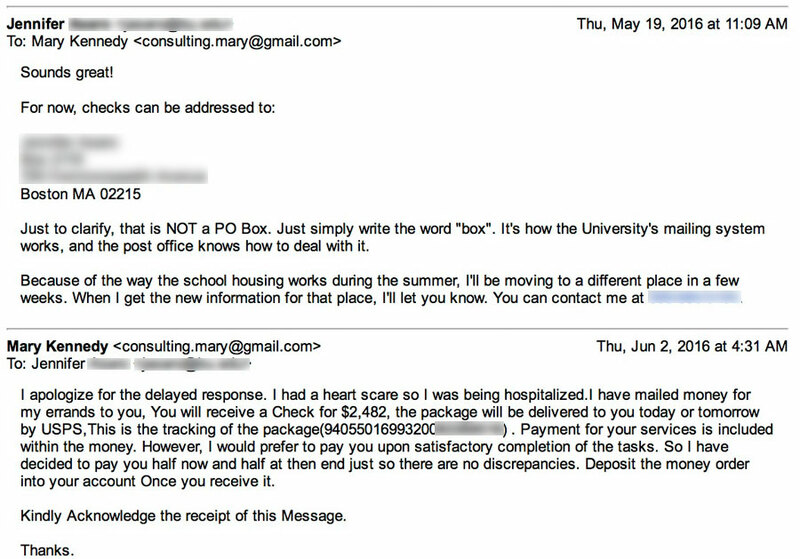 Emily then became suspicious that “Jason” would send her a check to deposit only after exchanging a few emails with her. She Googled some of the information in his emails and came upon our article. 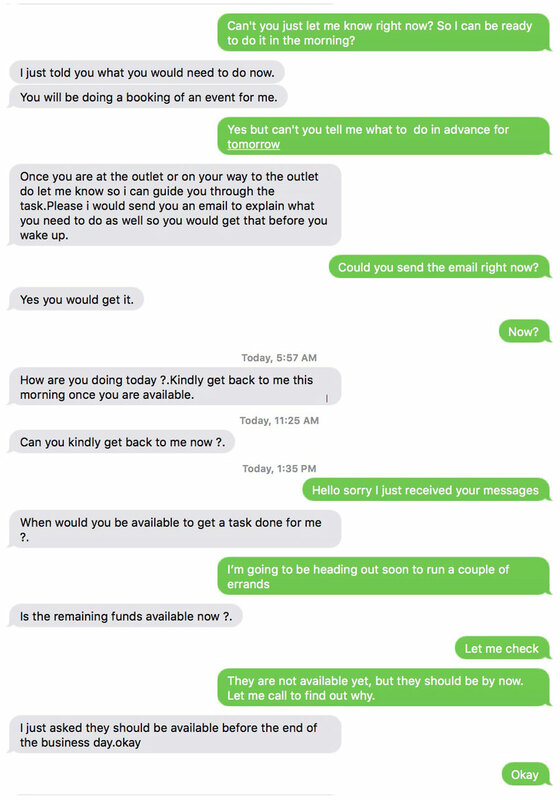 Fortunately, she found us before falling for this scammer. 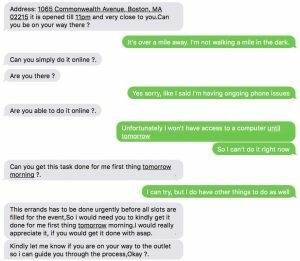 In late October a reader contacted us about a job offer for a “personal assistant” from someone claiming to represent a company called Ozan, specializing in the design, development and production of quality plastic injection moldings. 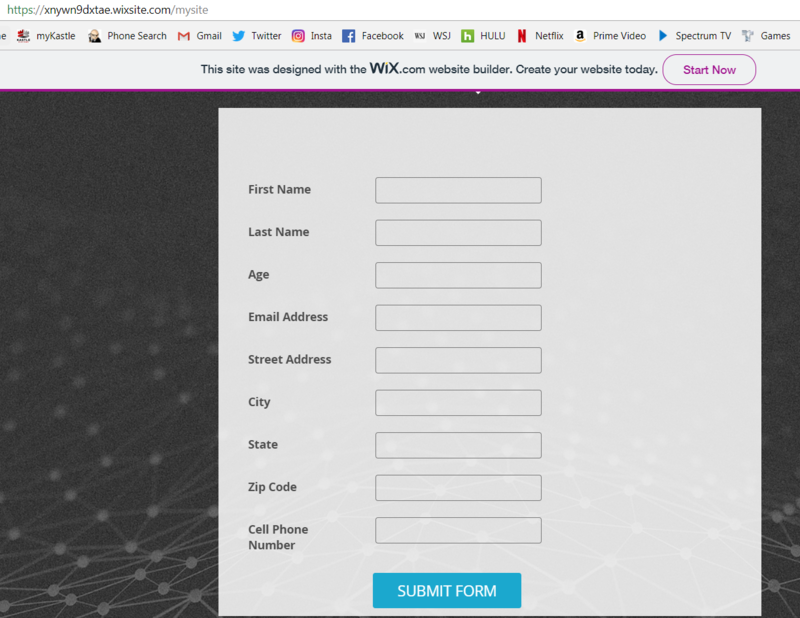 The whole thing is a scam created on the free webdesign site called wix.com at this account: https://thomas569bryan.wixsite.com/sirthomasbryan . We’ve seen this scam before set up on this site. 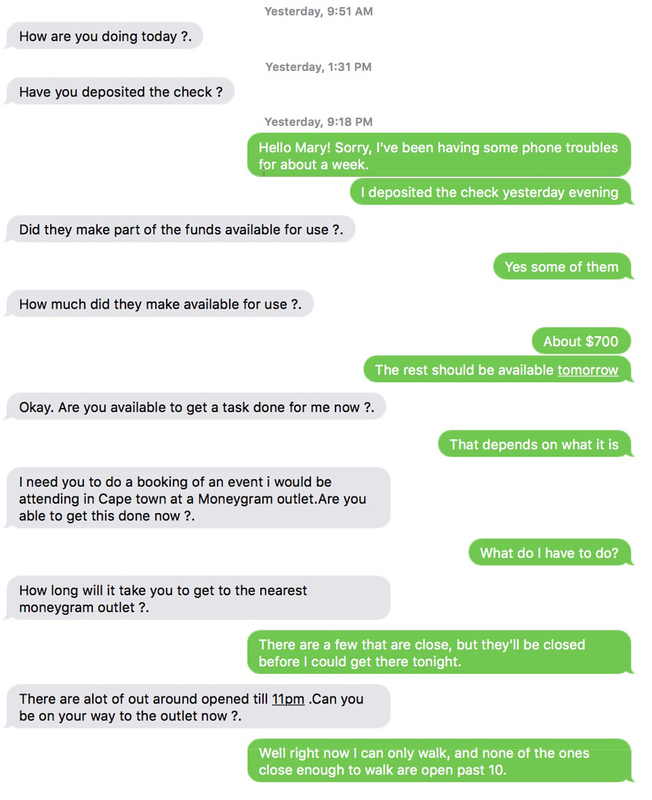 The text reads…. I own a company that specializes in the Design, Development and Production of Quality Plastic Injection Moldings for the Manufacturing Industries, because of my frequent travels and tight schedules, I’m in need of a Personal Assistant who will be working with me closely, I really need a helping hand with my daily schedule and activities. • Perform official assignment to detail/ instruction. • Creating orders/pick slips/invoices/credit memos. • Work independently without much supervision. Willing to take this job position? Fill the form below with your information for background check. 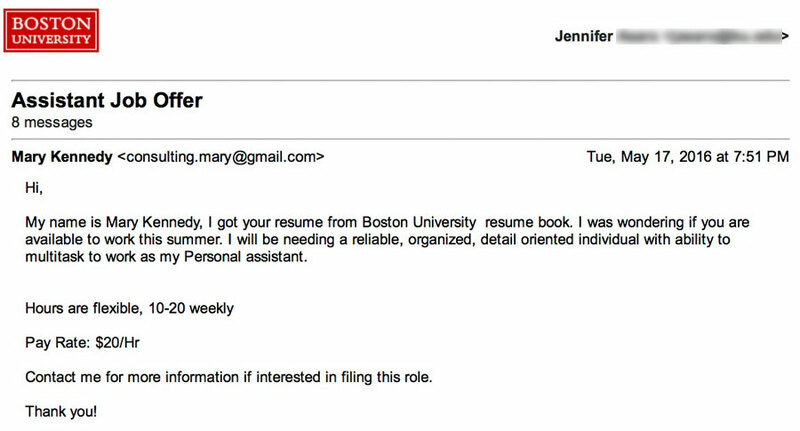 I got an email on my school email asking for a “personal assistant.” I was eager to get a second job, especially one that I don’t physically have to be in: “like dropping a mail at the post office on your days off, when you are less busy, on weekends, on your way to or from work.” As soon as I saw that I applied by pressing that link (xnywn9dxtae[.]wixsite[. ]com/mysite) which sent me to the second image. The name of the company I assume is OZAN because of the small logo right above the word Personal. I applied. Today, 8/29, I received a text from (613)317-1518 so I did a phone search which I use here at work to detect a scammer and no record comes up for that number and I trust that website. 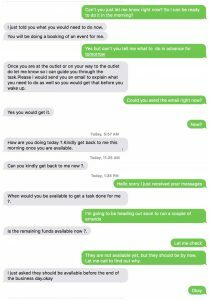 The text message told me to look specifically in spam mail so I did and “Thomas Bryan” sent me an email as seen on image 6. Now who the hell is Thomas? I thought this was for Benjamin? I searched up the email and that’s how I got a couple of websites, yours included, talking about it might be a scam. I even searched up he company along with what he described the company to be “Design, Development and Production of Quality Plastic Injection Moldings for the Manufacturing Industries” which led me again to websites saying they were a scam. How are you today? I hope very well. I am glad to employ you as my Personal Assistant. I hope my decision will be worthwhile.I would also want to seize this medium to inform you that am hard on hearing, though I read lips and know the sign language (I believe this shouldn’t be a hindrance in us working together if you are interested in filling up the position). I’ll be using the next three weeks to test your efficiency and diligence towards this, also to work out your time schedule and fit it to mine as I’m away at the moment for business. I need the perfect person for this job and I’m confident you can take up the challenge and on the long run we should have a relatively sound working relationship between us. I have had to put a hold on a lot and I would appreciate it if you can be available for me immediately like I mentioned in my first message to you that I need a serious applicant for immediate engagement. I will get back to you tomorrow with the details of your first task that you are going to perform for me starting from tomorrow. Kindly confirm this email received. Take care, enjoy the rest of your day. Hello once again [NAME REDACTED], Like i promised, please be informed that a payment of $1895.00 has been issued in your name by my client. It has been sent to the address that you provided and will be delivered on Wednesday. The USPS tracking number for the package is;9470101699320004752539 so that you can Track it from time to time and schedule yourself to be available for the delivery. Once you received the check go ahead to deposit it at your bank or via ATM and you can also make the deposit through your Mobile application if you have any. 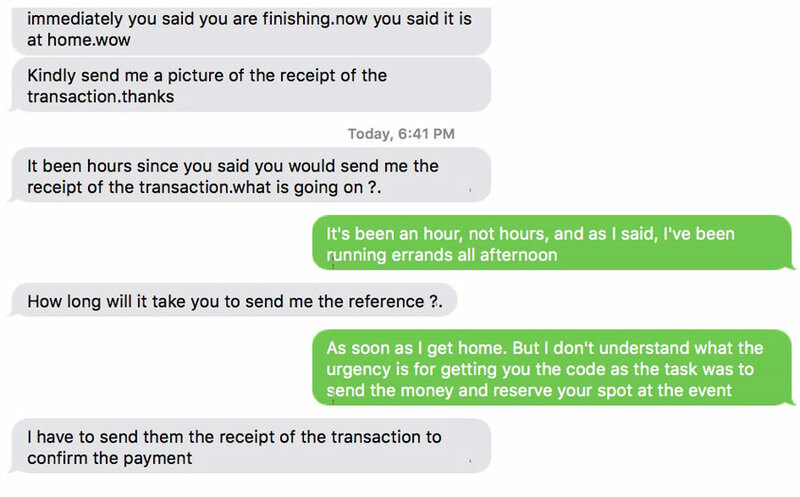 The payment takes 24 hours to clear at your bank. Once cleared, deduct $500 out of your wages for the first week, an extra $40 for postage stamps for some mails you’ll be dispatching for me next week., You will need to pay my supplier’s bill as well once I received my updated outstanding bill. I’ll let you know what items you’ll be buying with the remaining balance of $1355 once I prioritize which of the assignment should go first especially the items that you will need to purchase for the foster kids & dispatch to the Foster Home though still expecting a list from their Matron. All the shopping you’ll be doing will be done locally. You would be sending out letters with my official seal which I intend sending to prospective clients of mine in the States next week. I’m still composing the body of the mail you’ll be sending. Once I’m done composing it, I’ll send to you as an attachment together with the names and addresses of these clients so that you can print them out, address it to each person individually and dispatch it. Find out purchase price of an HP printer(Black & White)at any nearby store and keep me posted so that I can decide on which one you should buy. All things being equal, I should be also be available by 2nd week in next month. I anticipate meeting you in person then. 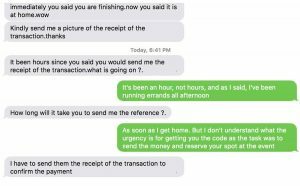 Kindly confirm that you understand what you need to do as soon as the payment get delivered. I hope to be having a sound working relationship with you. Kindly confirm to me that you got this text and its well understood. Mr. Diaz contacted Gina using the email address “rubendiazconsult “@” outlook.com” Another email address used in this scam was “barryester “@” outlook.com.” NOTE: Ruben Diaz claims to be hard of hearing, but reads lips and knows the sign language –which is an excuse why you can’t speak to him by phone or video chat! To engender sympathy from his potential victims, Ruben Diaz also told Gina that he works for place that takes care of foster children. This guy is a total sleeze bag! He texted Gina from phone number 720-432-0517. 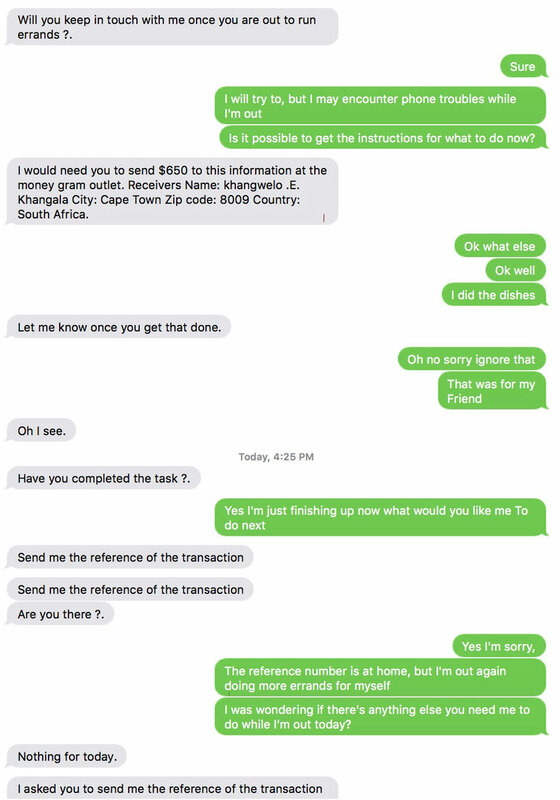 This number has been identified as being used for scams like the Personal Assistant scam 106 times on the site efraudsters.com! 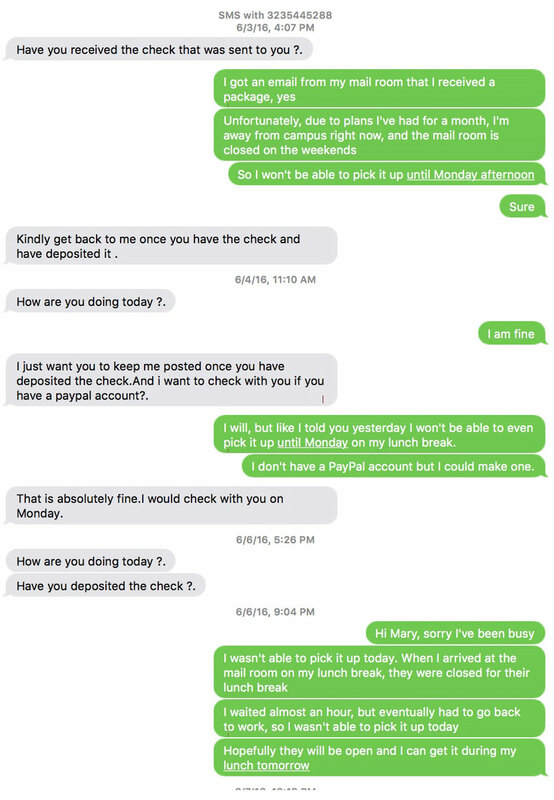 We also found that number listed as a scammer on 800notes.com back in 2013! 1. Why would a Doctor hire a “work from home” person rather than someone in/around his/her community? 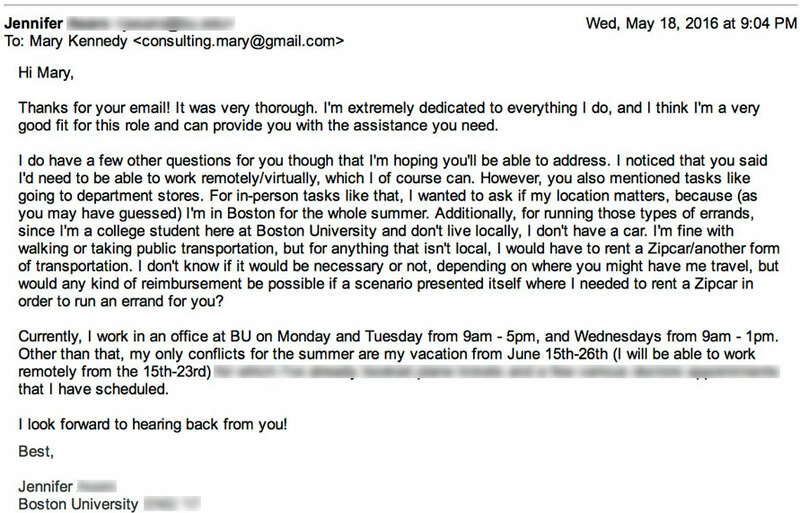 And why would this person ONLY conduct an interview through email? 2. Who is Kennedy Snavely? And why is he/she doing this search for the doctor? 3. Using Google, we couldn’t find ANY Doctor named “Adkins Brown” anywhere in the world. Dr Adkins Brown is currently looking out for an assistant who is self motivated, reliable, articulate and eager to learn with minimal supervision required to work-from-home part time as his Personal Assistant. > Manage diary and schedule meetings and appointments?? This is to acknowledge that your application resume has been received and you are being considered for the post as my assistant. This will be a part-time home based job for now. Fill your information below for background check. Kindly respond as soon as possible. The hours will be between 5-6 hours in a week and the hours are flexible so you can spread the 6 hours a week at your convenient time. I will pay $250 weekly and I will provide you with sufficient funds and adequate instructions for every task. It is not a must that you have a car for the job, You can go places by bus or taxi. I will be sending money for my errands including payment for your service and running around expenses. I have a financial in the state which will handle your payment. The payment will arrive inform of a check payable into your account for the process of my assignment according to the instructions given to you prior my arrival to the states as scheduled. I wish I could meet up with you to talk about this job in person but I am currently away on business and convention but I will arrange a proper meeting in person in 2 weeks if that is okay with you so that we can meet in person and know more about you in person. Most importantly what I really need from you is your total honesty and organizational skill. Let me know if you can give me these service which could act as a good start to our working relationship. I will prepay you in advance to order for some items prior to my arrival, you will be properly briefed & given a comprehensive instruction via email or phone. This is just an illustrative message, soon as I’m back to the States in 2 weeks time, I will arrange a proper meeting for us both, during which proper documentation will be done. Application details and requirements followed. 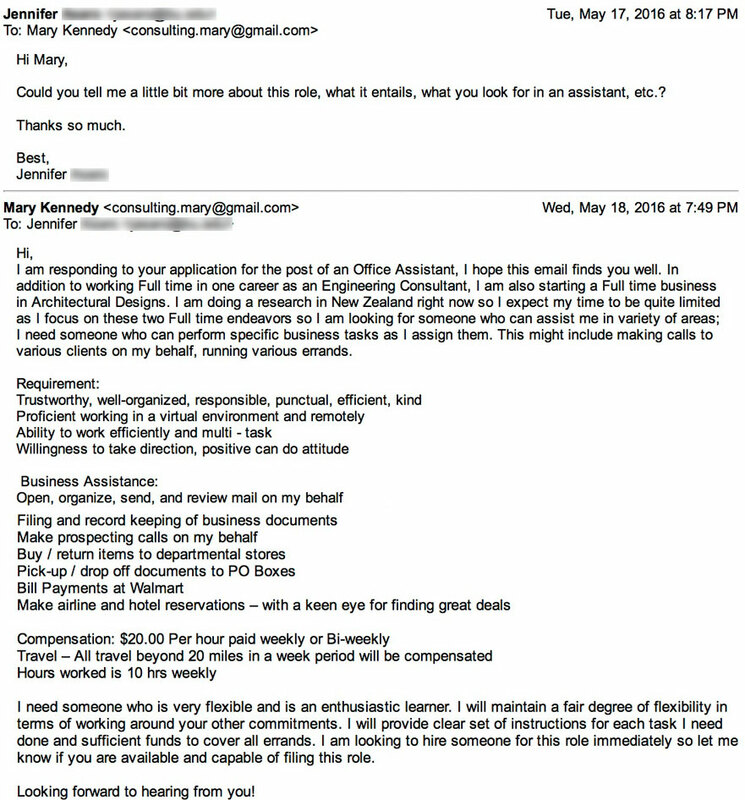 Notice that “Frazier Katherine” also says that it is not possible to talk about this job in person because she is currently away on business. NOT BEING ABLE TO SPEAK OR VIDEO CHAT IS A MAJOR RED FLAG AND TELLS YOU THIS IS A SCAM!